RIO DE JANEIRO, BRAZIL – For those who live in Rio de Janeiro, the mass robberies that sweep the beaches known locally as “arrastões” (big drags) have been a way of life, but recent years have seen an increase and authorities are struggling to react. This last weekend the iconic beaches of Ipanema and Arpoador were attacked again, and this time the violence spilled out across Zona Sul (South Zone). Last year police step up efforts to stop “arrastões” (big drags) occurring on Rio’s famous Zona Sul (South Zone) beaches, photo by Clarice Castro/IMPRENSA RJ. A partial report released on Monday by the Civil Police show that between Saturday and Sunday, 22 teenagers and six adults were seized, all caught in the act of robbery or theft in Zona Sul. Police found necklaces, watches and mobile phones on all the accused bandits. In reaction to the sense of chaos the president of the Brazilian Association of Hotels (ABIH), Alfredo Lopes, criticized the performance of the police and said that two conferences were canceled recently in the city because of episodes of violence prior to the weekend. In November 2013 State Secretary of Safety José Mariano Beltrame vowed to reinforce policing on Zona Sul beaches with an additional six hundred military police officers, among other initiatives, in response to a wave of mass robberies conducted that year. 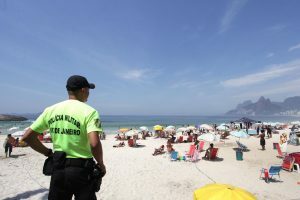 The initiative to increase patrolling on Rio’s beaches included reinforcement from the Shock Battalion troops that were to guard the beaches: from where the water hits the shore to the bus stops that line the streets alongside Leme, Copacabana, Ipanema and Leblon. The increased police presence would operate from 9AM to 7PM on weekends and holidays. Last November (2014) the first integrated center to help process youngsters opened in Laranjeiras with the objective of steering youths away from crime and illegal activities. “We are all in this together,” said Rio’s vice-mayor, Adilson Pires, who heads the Secretaria Municipal de Desenvolvimento Social – SMDS (City’s Social Development Secretary). The center was intended to work with professionals from the child-welfare department and human rights agencies to process the youth, find his family, and if possible return him to his municipality. The SMDS also announced plans to expand access to cultural and sporting activities with the objective of reducing the idle time of these youths. However the attempts to predict and prevent large groups of young men from getting to the beaches has met resistance as accusations of racial profiling and outrage about the treatment of black youths. The tactic of stopping buses from Zona Norte (North Zone) and divert young men from going to the beach has proved highly controversial and left authorities looking for other security solutions. With all due respect to Cariocas and having lived in Brazil for 4 and a half years and in Zona Sul for 2 years, I do not agree that Rio is tourist-friendly. Cariocas actually hate the gringos ….. they curse them. However, their point of interest in a gringo is only from the perspective that they have $$$$ (!) And if the gringo does not speak Portuguese, God help him / her ! Moreover, how can one “zone” of a city represent the “whole city” ? This further manifests itself when the Cariocas living away from zona sul bad-mouth the cariocas from zona sul. Also, there is a strong under current of discrimination amongst Cariocas living in Zona Sul (!) For example, a Carioca from Leblon would not be too friendly with a Carioca from Copacabana or Leme (!) – may be because Leblon is “superior” to Copacabana (from the real estate valuation perspective). Rio lost it’s reputation as a dangerous city……when did that happen? Just as a point of interest – “arrastão” is actually a large fishing net, dragged along through the water by a boat, capturing everything it comes into contact with. This is where the term for these group muggings originated, rather than the meaning given by the reporter – “big drag” – even though they certainly are!! Ron could not have painted a worse picture of this beautiful and amazing city. Yes, Rio has a lot of issues and crime in tourist areas is certainly of concern, but I have met few people more genuine and friendly than cariocas and Brazilians in general with regards to their attitudes towards foreigners. I say this as both a gringo and someone who lived in Rio for over two years. Beach robberies are not only of concern for foreigners, but cariocas as well are fed up and tired of these crimes. It paints a horrible picture of what I would call one of the most beautiful cities with some of the most beautiful people on the planet. If you let negativity influence your decision making in where to travel to, you won’t even leave your house! In every major city, their is crime and corruption. I have been traveling to Rio de Janeiro for the last sixteen years, and I feel safer there than I do here in Washington D.C. The friendships I have developed there will last a life time. The people are so down to earth, and genuine! The problem isn’t the children who are trying to survive the best way they can, it’s the government and their CORRUPTION. fix the corruption issue, and the children won’t have to rob and steal. My Opinion. Christian : The city is amazing and I have friends too who are Cariocas. However, my comments are based on observation of the mass and not a group of people who are friends. Hence, we need to allign our perspectives. Alex : Guess who have a carioca girlfriend which perhaps justifies your emotional outburst. Or perhaps you are trying your hand in politics which justifies millions of Cariocas to be your friends ! As I mentioned to Christian, my comments are based on observation of the mass and not a group of friends only. Ever heard of the word “majority”. So where is your girlfriend from ? “Duque de Caxias” ? No ? Maybe “Bom Successo” then …..No ? Then definitely “Cidade de Deus” !!! These places notorious for its “not so friendly people” are parts of Rio too, right and they are called Cariocas too, aren’t they ? In fact, in Bom Successo, the milícia (armed rebels) gunned down a police chopper, right ? So why are people & you so obsessed with Zona Sul ? Why not talk about the rest of Rio ? Or you selectively choose to decide what Rio is ? By the way, just to let you know, I still have my job and I have a Brazilian girlfriend from Belo Horizonte (!) Cheers! Our hotel is on the Copacabana side of the Tunel Novo linking to the shopping mall Rio Sul. Other threads in travel forums warned that the tunnel might not be safe. Our hotelier said it was safe and the police guarded the area. Sunday afternoon we walked through. Ensured that there were others walking too. No issues during that walk. Decided to head back before it was dark. 5:30pm. More people heading towards Rio Sul than Copacabana. As my wife and I walked, a young Brazilian girl in her 20s walked just in front. Crowded buses in the traffic when I noticed a young male (late teens) jump off the bus and run through the traffic towards us. Just as quick he grabbed the young lady’s handbag. As she struggled to hold on to it. I jumped in and grabbed it too until he let it go and ran off. It was all over as quick as it began. The lady was visibly shaking. We walked her through the tunnel as my wife comforted her. Although we are in our late 50s/60s,we could not stand by and did what we could. We did not get her name or details. Atleast she is safe and yes. It could have been worse or a more different outcome but you dont think of these things.